When kids are toddlers they tend to like the same books read to them over and over and over again. But that’s great for their brains. Nevertheless, we parents may not exactly enjoy reading them repeatedly. Now that my kids are past the toddler stage, I can look back on some of the best toddler books which I didn’t mind reading again and again! Ten Nine Eight by Molly Bang. Of all the books on the list, this gentle, rhyming bedtime story is my favorite. Even all these years later, I can recite the entire book from memory. And perhaps brush a tear or two from my eye! Goodnight Gorilla by Peggy Rathmann. 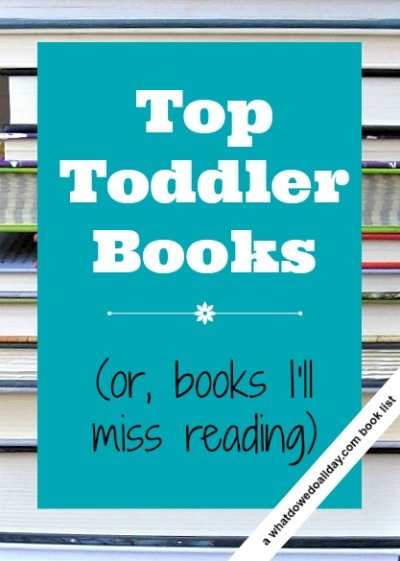 This book can be found on many lists of the best toddler books and for good reason! This light-on-text board book offers humor, whimsy, a chance for kids to be “in the know” as they watch the gorilla sneak behind the zookeeper’s back. There is not a lot of text, but there is a lot of fun. Moo Baa La La La. I found it nearly impossible to choose a single Sandra Boynton book. In fact, go ahead and purchase her entire oeuvre! All of her classic toddler books speak so well to a little one’s need for rhyme and enchanting sounds. Higher! Higher! by Leslie Patricelli. By the time your child has been hanging out at the playground on the baby swings he or she will know the joys of flying, which are well replicated in this charming book. Orange Pear Apple Bear by Emily Gravett. I love that Gravett created an engaging tale for toddlers with only four (and a surprise fifth!) words. Delight your child further by bringing out a few props — some fruit and a teddy bear and give them a hands-on reading experience. Freight Train by Donald Crews. Boys and girls will adore the simple and bold illustrations and the spare but engaging text of this classic toddler board book. One of the absolute best toddler books out there! Rosie’s Walk by Pat Hutchins. This wordless book may not appear to be a first choice for toddlers, but studies show that “reading” wordless books to children increases their vocabulary and builds reading comprehension. As a bonus, the slapstick of this simple tale is hilarious. Bark, George by Jules Feiffer. For toddlers who are just starting to have fun with animal noises, this giggle-inducing classic is just the ticket. The dog George isn’t making the right noises, so his mother takes him to the vet where they encounter quite the surprise! The danger of making a list of “best” toddler books is that inevitably some gems will be left off. But that’s what the library is for! Be sure to keep your kids bookshelves stocked at their level so they have unfettered access to the books they love. 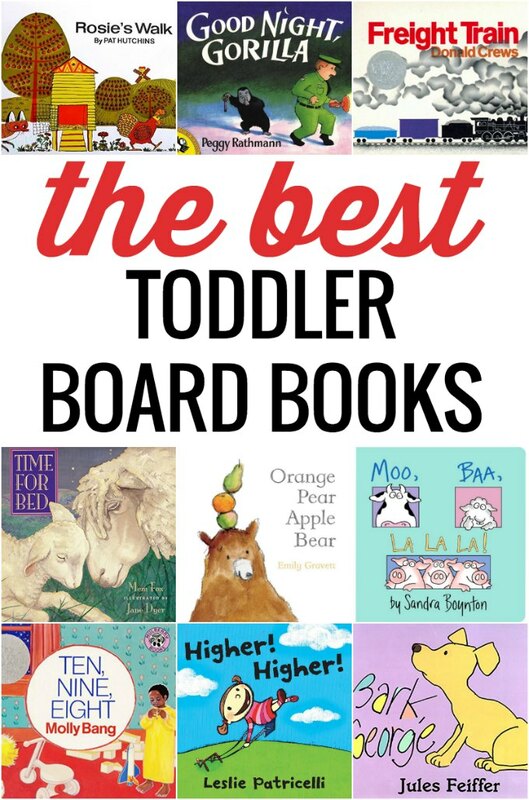 Providing sturdy board books will keep you from stressing about all those ripped pages, and toddlers who love books grow up to be adults who love to read! Boynton's “Pajama Time” was so standard at our house, I can still recite (almost) the whole book. We last read it around 2005/2006. Richard Scarry's “Best Storybook Ever!” was a childhood favorite for me and one I bought for my kids. Every few pages is another story or spread of labeled items (like all the things one could have for breakfast). Somehow I've never read Scarry to my kids. I'm not sure how that happened. Moo, Baa, La La La is one of my all-time favorites! Believe it or not, we haven't read any of the others much – time to check them out of the library! B. Potter's A Fierce Bad Rabbit was my toddler daughter's favorite for a long, long time. Luckily, I loved it too. It made reading it ten times a day bearable. Like Butter On Pancakes… something about it. And Where The Wild Things Are, because now that I have a little boy I GET it. (And Love You Forever, for the same reason. I was never really into it when I read it to my girl, but after a rough day with my little guy it reminds me how much I love him.) I will totally miss reading Bed Hogs, because I love reading it with a “country” accent. We also love Goodnight, Gorilla. I'm amazed by the hundreds of different ways we end up reading that book. Can't wait for your top 100 post!! Ok Since my little bitties are getting bigger… this one made me cry! Thanks for the reminder. Great list of books. Great list. Richard Scarry books were always among our favorites. Thanks for joining WMCIR! Yes, yes, yes! I miss reading some of the little classics. I think it's a mix of a great book, but also remembering them being so small. I NEVER have to stop reading picture books because it's my job! Bobo and I have lots of favorites… Lift-the-flap books like Spot and Karen Katz (Where's Baby's Bellybutton). The Dinosaur VS books (the potty and bedtime, especially). One that gets him laughing is There's a Monster at the End of this Book, Grover voice is a must! 10 Little Fingers and 10 Little Toes was my youngest boy’s ‘special book’ that I always read to him at bedtime – I really miss reading it! PS I wanted to share with you something from my boys’ school I thought you might be interested in – the teachers have set up what they call a ‘reading tent’ in the school playground. It’s just a normal camping-style tent with some cushions inside, and every day 4 kids are chosen to have their turn in the ‘reading tent’ at recess and lunchtime. I couldn’t work out why my boys were so excited about it – I mean they can read any time they like at school in the playground or the library etc (not to mention we have a tent permanently set up in our back yard with books/games etc). But my older boy was beside himself with excitement when it was his turn in the reading tent and went off to school armed with 5 books just so he didn’t run out of things to read. After school he said he and his 3 friends spent all recess and lunchtime reading in the tent and it was ‘fantastic’ – I think from talking to him that what made it so exciting was that it was a special place that only they were allowed to go into and they could tell everyone else to keep out, I guess there aren’t many places at a busy school where kids can have their own territory – even if just for a day. I thought it was a fun way of encouraging some extra reading and showed that it doesn’t take much to get kids enthusiastic about hanging out with their friends and some good books! That is wonderful! Thanks for sharing that with me. I love your booklists! A new discovery with our second little was The Swing by Robert Louis Stevenson, illustrated by Julie Morstad – classic text with inclusive images. Thank you for the recommendation. I like Morstad’s illustrations a lot so I will look for it! Such a great list! Thanks so much for sharing. My older kids still love Sandra Boynton’s books, and now they read them to their baby brother. Goodnight Gorilla was another favorite of ours. We read it so often our cover fell off!